This page was created to provide news updates and information about events surrounding the unexpected death of Kurt Schwenk, Paula Barnes, and Gavin Stearns. It is meant to be a place where you can come to find past and present emails that were sent to a list of friends, as well as pictures and link to other sites with related information. There used to be an active mailing list, but due to inactivity it was shut down in December of 1999. Watch this location for news updates regarding events and the contents of this site. I still maintain this site, andc occasionally add material. I would love to add more pictures and stories, but depend on you to send them to me. 01/27/06 Added link to NTSB documents about the event. 11/26/01 Added interesting articles from the Atlantic Monthly. 6/12/00 Updated some newspaper article links and removed reference to mailing list. 1/15/00 Updated the note above. And moved future events to past events. No other changes. Added recent emails. No other changes. Moved some events from future to past section. Added a "Stories & Letters" section. Added a section summarizing all donation information. Added a picture of Kris Anderson throwing the wreath into the ocean. Added a page with Paula and Gavin pictures from the Weldon wedding last year. The event for November 12, as well as the event for November 15, are now firm. See below. A link to a new Web site with a tribute to Paula and Gavin has been added. New information about a Boston memorial and celebration has been added. New links (articles and links) added to links section. Address for Lisa Stearns added. 11/09/99 The event information has been updated for Nov 12 and Nov 15 events.Click on the appropriate links for expanded information. A report on the wreath laying by the Marblehead sailing group has been added to the events. 11/08/99 Palm Computing and 3Com have encouraged their employees to make donations in Kurt's name. Palm/3COM will match employee contributions. If anybody has the missing addresses, please let me know. Here is a list of events that have already taken place, and of those that are still to take place. The gathering in Paula's backyard on November 2 was a spontaneous event. Judy Hammer, one of Paula's friends took the initiative and the news quickly spread to friends of all three. Judy's email was also the start of the email list. California Friends came together for a candlelight gathering to remember and celebrate Paula, Gavin and Kurt's lives. Flowers, candles, pictures and stories were shared during an evening reception in the garden area of Paula and Gavin's home in Los Altos. The story captured the hearts of the S.F. area when it appeared in the San Francisco Chronicle on Thursday. After the event ended, several people picked up all the candles and moved them to the front doorway entrance, as a memorial. Pictures were taken and are available on this Web site. On November 4th, about 25 of Gavin and Paula’s close friends, many from the original band of Wet Wednesday Wrinklers, and from the early Computervision days, met in Boston. We reminisced, and laughed, and cried, and comforted each other, while a slide show of photographs taken over the years was projected on the wall, and candles were lit in honor of Gavin and Paula. Paula and Gavin's coworkers and friends at Aspect Development also came together in a special rememberance held on Thursday. A beautiful slide show and collection of stories were shared by those closest to them. Aspect's CEO and chairman, Romesh Wadwhani, was honored to announce two awards established in their names to continue celebrating their lives and contributions. These awards will be granted every year to 2 Aspect employees who carry forward Paula and Gavin's spirit of adventure and commitment to excellence. Rich Stegina has posted a number of photographs on-line. We then threw 8 red roses into the ocean. It was very moving. After we all calmed down a bit, we opened a bottle of Mt. Gay Rum, Gavin's preferred beverage, and poured an offering into the sea for him, before we passed the bottle around. It was comforting to each of us to be there, and to celebrate Gavin as the old salt that he was. There were some photos taken, at the request of the family. We are also planning a more formal memorial service/celebration of life for both Gavin and Paula in the next couple of weeks. We do not have a date yet, as we are waiting for confirmation from the families. A celebration of Paula, Gavin and Kurt's amazing lives was held on Friday evening, November 12 at the Thomas Fogarty Winery in Woodside, up on Skyline Boulevard. The event was planned by friends of Paula and Gavin, but honored all three. Paula's sisters Tamara and Lisa were present, as were Gavin's mother and Gavin's sister Lisa from Norway. After some informal time, a formal memorial was led by a local minister. Several speakers talked about Gavin, Paula and Kurt and two slides shows were presented. After the formal memorial ended, people hung around, danced and enjoyed memories. Click here to see the original invitation. The "Rochester Yacht Club Sailors Trust" (c/o the above address). This trust sponsors youth sailing programs. Both Kurt and his mother were involved with this program. The "Lakeside Foundation", 156 West Ave., Rockport, NY, 14420. This foundation runs the hospital where both Kurt and his sister Mitzi were born. A charity of the donor's choice. Seven West coast people have traveled to and attended this event. Another celebration, of Kurt, Paula and Gavin's lives was held on Monday night, November 15. This event was planned by Kurt's friends from California. The event took place in a private room at Zibibo's in Palo Alto, sgtarting at 7:00PM. A memorial service was held for Paula and her parents at the Mile-High church (Alameda and Garrison) in Lakewood, CO. The service took place on November 19, at 4:00PM. 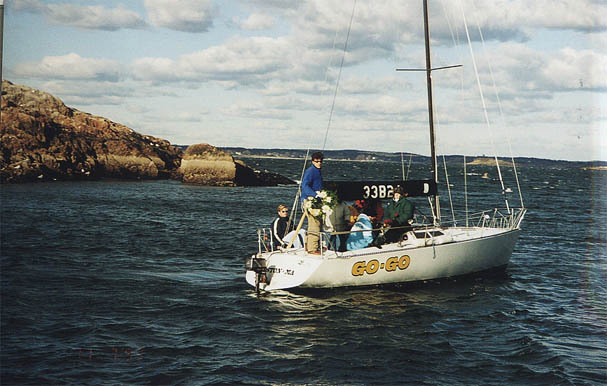 A Memorial Service for Paula Barnes and Gavin Stearns was held at 2:00PM on Sunday, November 21, 1999, at Chandler Hovey Park on Marblehead Neck, Marblehead, MA. A Celebration of Life reception was held following the memorial. This section attempts to collect, in one place, all information on making donations in the name of Kurt, Paula, or Gavin. This is just a collection without any particular ordering. Where available, the persons suggesting the recipient has been listed. Kurt loved Golden Retrievers. One of his dogs was adopted from Norcal Golden Retriever Rescue. This is a non-profit, volunteer run group. Kurt's West coast friends are suggesting this organization as a possible recipient of gifts in Kurt's name. Norcal will send a note to a designated member of the family indicating that “so and so has donated x amount of dollars in Kurt's name” and will send a receipt back to the donator (for tax deduction). No particular causes have been identfied to me. If you know of any, and I will include the information. No particular causes have been identified to me. If you know of any, and I will include the information. Here you will find stories and letters sent to me about Paula, Kurt and Gavin. It is with deep sorrow that Flight 990 has claimed so many lives aboard including the EDA and MCAD industry's true pioneers. Tamsin (Tammy) Barnes and her husband William (Bill) Barnes of Idledale, CO were aboard this tragic flight. Tammy and Bill, as the founders of Autotrol Corporation in the late 1960's, developed many of the basic technology that provided the foundation for today's crucial EDA and MCAD industries. Among their innovations was the digitizer that was used to copy graphical geometry from paper drawings into fundamental databases that were used to drive Integrated Circuit and Printed Circuit artwork generators, David Mann and Gerber, respectively. This single CAD technology provided the technology and financial basis for all EDA today. The computer and semiconductor industry as it is may not exist today without their foresight and creativity. Other innovations included line types and text properties for mapping, architectural, and mechanical CAD. In the early 1970's, they sold Autotrol to M & S Computing which the combination became what is now know as Intergraph Corporation. Their innovations grew under this new corporation and industry. Later, Tammy and Bill were prime movers with Applicon in developing wire frame 3D technology which laid the foundation for today's MCAD industry and computer animation. Companies like Pixar and Disney today enjoy the primitive wire frame technology that Tammy and Bill so skillfully sponsored. Most computer animation today starts with wire frame models and companies like Boeing and General Motors use this fundamental to design their products. Today, our industry and economy enjoys the fruits of their technology seeds. Tammy and Bill helped give birth to our world wide technology and economy. It is a true loss to loose these very fine and lovely people. To deepen the sadness, their daughter, Paula Barnes was on the same flight with two of her best friends, Gavin Sterns and Kurt Schwenk. Paula was employed by Aspect Development of Mountain View, CA as a Sr Account Manager. Several pictures were taken at the gathering on November 2. Click here to see them. Pictures of Kurt, Paula and Gavin are made available by Rich Stegina. Rugby picture of Kurt and story is available on the San Jose Seahawks home page. Wreath laying on November 7, 1999 (Marblehead, MA). Pictures of Paula and Gavin taken at the Weldon wedding, August 1998. Some picturesof Paula, Kurt and Gavin, on the Wet Wednesday Wrinklers site. If you have pictures you can contribute, send them to or let me know the appropriate URL. Here you will find links to other sites of possible interest. San Jose Mercury Article, from November 1, 1999. (Bay area victims, slightly different from above). New York Times, November 2, 1999. (Victims around the world, piece about Kurt. Photo album by Rich Stegina. San Jose Seahawks Web page.